I spend today taking care of business, with the first stop being the computer repair shop. They figure it will only take about an hour or so to repair it once the part arrives. Thelma’s husband (and Farmer Jane’s father) Mark drops me at the computer repair place and, when the owner, Norton (like the anti-virus), steps inside to meet me, a package containing my tiny part (most likely made in China for $1, yet costing me AUD$55) is sitting in a newly delivered express mail package. I drop my computer and begin to walk into town to grab some lunch and wander around when a car pulls up and honks its horn. Perhaps it’s one of my fans recognizing me, I think. Apparently I’m not that famous in Australia yet, but it turns out to be nearly as good as it’s a lady who arrived at the computer repair store after me and offers to drop me in town. I run my errands and go in search of a possible volunteer opportunity Norton told me about. I walk into a shop and ask if they know of it and a lady paying for her goods tells me she used to both work and volunteer there and she offers to drop me there (gosh this town has some friendly people). After speaking with the volunteer place, getting a tour, and telling them I might stop by on my return to Brisbane, I walk back towards the computer repair shop and, on the way, find a video store (they still have them here, along with phone booths) offering five DVD ‘s for sale for AUD$20. Thinking ahead to my camper van rental tomorrow, I buy five films which I’ve always meant to see but never did (my sister calls me cinematically retarded) as my camper van has a DVD player. After a few hours, I return to the computer shop to meet with my newly repaired computer and a AUD$145 bill. The following day Thelma’s man takes me over to Spaceship Camper Vans where I collect my Spaceship. You may remember my experience in New Zealand with Camper van Beethoven and My Man Friday. 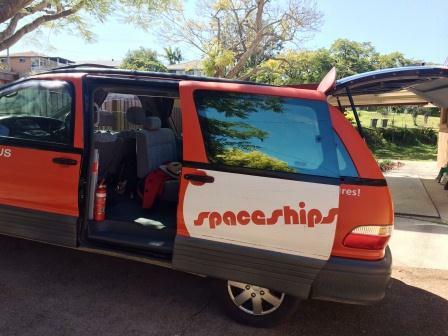 I’ve decided to rent a camper van in Australia for two reasons: First, it’s kind of the cliché thing to do in Australia an second, I want to cancel out the bad memory of how that ended and exchange it for something positive. Sort of a do-over. With just myself and the van, I decide to name it Van Morrison as, It’s a Marvelous Night for a Moondance. This van is not nearly as nice as the one I rented with Friday, but it does have one thing going for it; it doesn’t include Friday. Unfortunately, most everything else is sort of crappy. 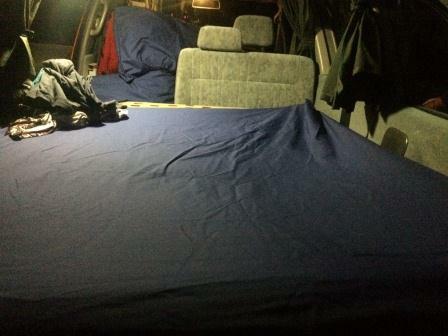 It’s really just a mini-van (maybe even a bit smaller) which has been outfitted with a bed and some storage beneath it. Oh, and by bed, I mean cushions. There’s a “cooling box” which, after I buy a bunch of groceries, being careful with the number of refrigerated items, as the cooling box is small, I find out, well, it doesn’t really work. And you have to turn it off at night as the cooling box, DVD player, radio and light are all powered by one battery which is recharged to full after three-four-hours of driving, but drain pretty quickly. After returning to the house to pack up my things, stopping for gas, groceries, and money, I drive only about an hour as I want to pull into a holiday park before dark to get settled in Van Morrison, and besides, tomorrow I plan to explore the Australia Zoo which is pretty close. I’m also heading north, up the Sunshine Coast as, well, it’s warm, where south, down the Gold Coast will start getting colder. I’ve had enough of being cold. I pull into the Ocean View Tourist Park at about 6:15; it’s already dark. This place is in no way like the New Zealand camper van parks, It’s a bunch of motor-homes shoved together tighter than a pregnant woman wearing skinny-jeans. Most seem to be main residences, and the ocean view apparently can be seen if, “In the morning you head over back behind these spaces.” It’s located just on the side of the main road and seems noisy. When I ask about the noise, I’m told, “When it gets a bit later, the traffic stops and we actually have people complain that it’s too quiet.” I use all my willpower not to say, “I led camping tours for three years and never did I have anyone complain that a campground was too quiet.” (Thank you for letting me get that out here.) Still, the facilities are clean and I’m tired. I lay in Van Morrison and, as it’s been a long hard day and I have no desire to try to figure out the storage, stove and everything else (oh, and there’s no picnic table), I lie in bed watching the Sean Penn movie Milk while drinking wine and eating bread with brie and Nutella (on separate pieces; I’m not crazy). I awake in the morning, grab a cup of coffee in town (my kingdom for a picnic table), eat some of the banana bread I picked up at the store, and drive over to the Australia Zoo. 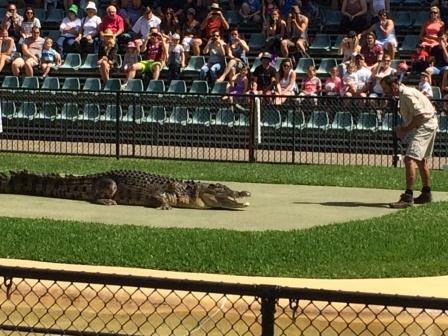 While I don’t normally go to zoo’s or circuses (I’ve seen African elephants with their mothers in the wild and have watched how they protect their young), Australia Zoo is world-famous for two things: The Crocodile Hunter and conservation. On the way, I stop at Landsborough Pines Caravan Park (only slightly more room, still no picnic table on my site but some around and a kitchen area with a TV) and reserve a spot for tonight as tomorrow is Father’s Day in Australia and some go camping for the weekend. As I pull into Australia Zoo’s parking lot, I begin to get excited. I’ve begun enjoying doing some of the tourist things where everything is taken care of for you and you simply need to pay your admission. I collect my ticket and start walking towards the Crocoseum, where there’s a show about to begin (there are crocs and I’m going to seum). The forty-minute show is really entertaining beginning with trainers bringing around a few snakes for the audience to view, and quickly moving on to the incredible birds. Many who know me know that I’m not a big bird fan (not as in Big Bird from the Muppets, but as in a big fan of birds). The way I look at it, the birds don’t know what they’re called, so why should I? Still, these are fun to watch. The birds depart and in come the crocodiles. I enjoy watching the trainers explaining croc behavior and the history of some of them (these guys live a long time). The Elton John song Crocodile Rock begins running through my head because, after this, I really do think that crocodiles rock. I continue to wander through, seeing Koala Bears (they sleep twenty-hours per day and eat for three-hours, kind of like your teenage son), Tasmanian Devils, more birds, Echidnas (porcupiney-like creatures), wallabies, emus (really big birds), Brolgas (see emus) and kangaroos. The kangaroos wander the park freely and have rest areas where visitors are asked not to enter. 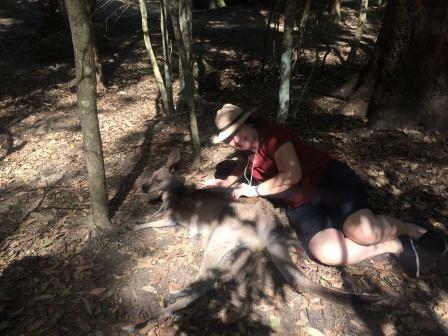 I have a special moment quietly petting a kangaroo lying in the trees. 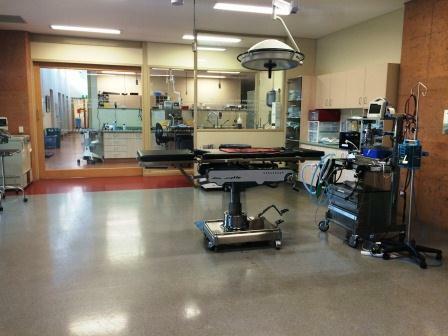 I head over to the Australia Zoo Wildlife Hospital where I’m shown around by the nice lady working at the desk. 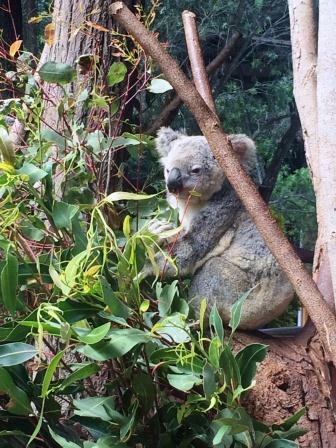 This place has treated over fifty-eight thousand- animals since 2004, and they treat seventy-koala’s per month. Most animals they treat were hurt by cars or dogs and the goal is to release them back into the wild. While they specialize in treating koalas and sea turtles, they accept any injured or sick wild-animals acting as a trauma center and then, when their well enough to move, other animals are transferred to care centers. 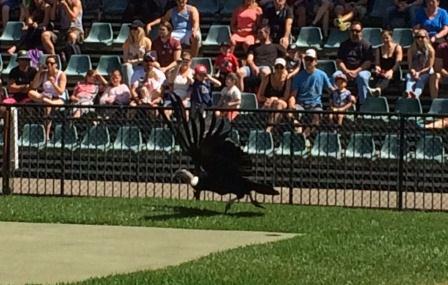 I leave Australia Zoo feeling good about my decision to go. I’ve had some long conversations with staff and volunteers here and, while I’ve never brought up Steve Irwin’s name, all of them have. They didn’t do it to promote the place based on his celebrity, they did it because they truly feel he helped these animals – as well as the relationship between people and these animals – and they’re proud to carry on his legacy. We’ve chatted about my experience at Disney and how we have something in common as we feel we represent the history of the place. I climb back in Van Morrison and head back over to the Caravan Park, ready to cook my first dinner with Mr. Morrison. Thanks so much for coming the the journey and for the support 🙂 only in Caloundra right now.